Metric: Nightmares (from the Khaaaaaan!!!). Got that out the way. Now to business! DISCLAIMER: This review is based on PDF copy provided by Rite Publishing with supporting map packs and paper miniatures. Overall: 3.75 nightmares. This is a book of two halves. Good ingredients with new rules, spells, feats and traits strewn among NPCs and monsters. Nagging slips in organisation, mechanics bloat and chibi-esque artwork tarnish good stuff wrapped in Jason Rainville's gorgeous cover. Canny GMs have lots to love with floorplans and riddles as well as quirky settings, fun encounters and memorable NPCs if they adequately prepare. Fans of the Rule of Cool will be squeeing hard. Content: 4 nightmares (5 nightmares in parts). The introduction starts off a bit stiff but kicks up a notch as things turn to the Plane of Dreams, lovechild of Lovecraft's Dreamlands and the old World of Darkness Dreaming. I like the setting and the gazetteer provides thumbnail sketches of various places to go and people to see along with some exquisite surreal art. The Dreamburning rules are reminiscent of White Wolf's Wraith or Evil Hat's Don't Rest Your Head. Creating a threat for high-level characters is a nice idea - attacking what drives them makes it different. Mechanically there are assorted feat-like traits but repairing dreams requires serious magic or sacrificing others and their dreams. There's no way good characters can inspire hope (or Hope). The mechanics are thematically consistent with the Coliseum's setting and explains the attitude of many major NPCs. A table summarising the Dreamburning options (and other feats) would be very helpful. An outline of what kinds of creatures live in the Plane of Dreams including new monsters like the chittering dream eater, malevolent denizens of Leng, oneirobound slaves who weave things from dreamstuff and predatory qarnjthak lends a more Dreamlands cast to the setting. I'd have liked more creatures here but the Coliseum and Appendixes scratch that itch later. Then the Coliseum itself, drawing on hints of Alighieri's Divine Comedy, early Bas-Lag, late Melnibone and the Village from The Prisoner. The history of the Coliseum is outlined with it's origins as domain for the nigh-omnipotent Khan of Nightmares. Now the Coliseum is a melting pot for the denizens of Dream, populated by primal entities, mechanical monsters, otherworldly opponents and feckless fey. Some read like using a large hadron collider on monster templates. For example the Hounds of Ill-Prophecy, tiefling were-Nessian hellhounds with levels. This aside, there's interesting folk - the Queen of Thistles, the Pasha of Swirling Ashes, Deuce of Clubs and the Khan of Nightmares make memorable encounters. Lady Puzzledeep is a gem showing how conflicting motivations can elevate a character. All the major NPCs also have Dreamburning options so they can join in the fun. Fans of Planescape will certainly approve. Then a series of enjoyable riddles before Chapters 6 - 8 take you into the Coliseum proper; that second half I mentioned. The Trials of the Damnation Epoch range from sublime to deadly and end in a very high-stakes game of King of the Mountain (yes even at 16th - 20th level!) before a series of proposed encounter structures in which the preceding pages suddenly make a lot more sense. Encounter setups make individual elements flow and offer staging tips and battlemaps. Putting Chapter 10 (Secrets of the Coliseum) between Chapters 6 and 7 would offer a layered look at plots enmeshing the Coliseum and it's characters. There are battlemap expansions for the encounters that are worth looking into including MapTool files - a nice touch acknowledging the presence of Internet-run games. Jonathan Roberts again excels in his cartography. Appendixes include NPC antagonists and potential characters who provide a benchmark. Everything you need to play is here. GMs seeking continuity could use this after Paizo's Rise of the Runelords Adventure Path by using both products' ties to Leng. Artwork: 3 nightmares. While the cover and internal art by Jason Rainville is beautiful, elements are liberally recycled particularly as cameos for boxed text. Minor NPCs get miniature-type artwork. Personally I think the contrast jarring, even though the miniature artists provide art for both Rite Publishing and Paizo. Maybe I'm being picky but it seems to detract from the visual appeal of an otherwise fine product. Overall, this is good stuff. It needs polish, an index for all the crunch would have been nice and the Dreamburning rules look balanced but maybe need their own indie game to truly shine. 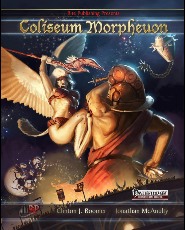 High-level Pathfinder adventures are not exactly a common commodity and the re-usability of the Plane of Dreams and the Coliseum as a setting makes it worthwhile for those high-levellers who've been there, done that.